A recent study found mobile pay users nationwide spend about twice as much as those not using a digital wallet. But good technology doesn’t have to ruin your good spending habits. 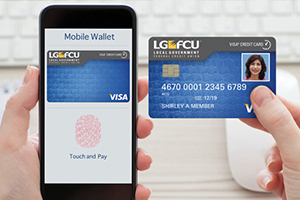 Digital wallets allow for quick and easy purchases using your smartphone or tablet. You can leave your wallet at home, and just tap, pay and go. Your payment information is stored in a mobile payment app like Apple Pay®, Samsung Pay®, Visa Checkout® or Google Pay®. A recent survey suggests that because nearly everyone carries a phone, it’s easier to use smartphones as a payment method. That’s good for retailers, but not so good for your long-term financial well-being if you’re not careful. Choose and use one card. Sticking with one card — like your LGFCU Visa® Check Card or LGFCU Visa Credit Card — helps you keep your finances organized. Your preferred card is the one you add to your device app, making it your default card for spending. You can change your default card at any time. With your debit card, funds get deducted right away, leaving no bills to pay at the end of the month. If you use a credit card, be sure you can pay the balance in full every month. Be careful impulse buying doesn’t become the norm. You’re still dealing with real money. Check in regularly to make sure your budget hasn’t gone off the rails. Use a digital money management service like LGFCU’s Compass. You can track your spending, create budgets, set alerts and see your transactions in real time. You’ll know if your spending is still on course with your original plan. Or you'll know if you need to make adjustments to get back on track. The wallet apps take steps to keep your card data secure during transactions, but it’s a good idea to take the extra precaution of locking your device with a fingerprint scan, PIN or passcode. With that in mind, check your transaction history in Member Connect often and watch for any transactions that seem unfamiliar. This increases the likelihood you’ll catch any errors or fraudulent charges on your account. Enjoy the convenience of digital wallets for fast and easy checkout. Just don’t lose track of your spending.